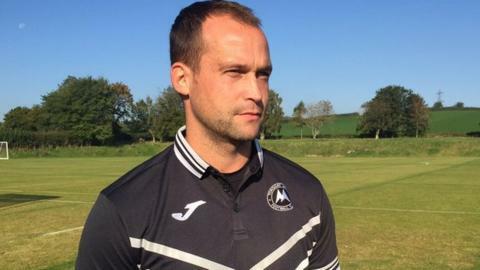 Torquay United boss Kevin Nicholson insists his side can avoid relegation after winning back-to-back league games for the first time this season. The Gulls beat fellow strugglers Welling 2-0 to reduce the gap to safety to seven points. And they have two games in hand on all the teams above them in the table. "It's achievable, it's doable, but they can't get carried away. It's a cliché, but it is one game at a time," Nicholson told BBC Sport. "I tell them not to look at the other results and just look after what we do, but I may as well bang my head against the wall because to be honest I sometimes go back and do it." Torquay will have an extra game in hand on Welling and Boreham Wood after the weekend, as the Gulls travel to Bognor Regis Town for their FA Trophy quarter-final. And Nicholson believes their bid for cup success will not adversely affect their relegation fight. "We've still got a chance of finishing the season and staying in this league and finishing at the end of May at Wembley. "That's got to be our target, and that's what I'm after," he added. "I don't care how many games we've got to play, when we've got to play them, but it's there to be done and we'll do everything we can to achieve it."